Hi, I'm Neil Price, your local behaviour therapist and trainer of Bark Busters Home Dog Training Northwich. If you’re reading this, you either share your life with a dog already or are thinking of rehoming one or even getting a puppy to add to your family. It may be that your dog has a few issues, or is even a diamond with rough edges, but whatever the issue I can help. I love helping people to understand and rehabilitate their dog and rebuilding their relationship into a strong bond of mutual respect. If you are frustrated, or at a loss how to change your dog’s behaviour problems, such as barking, hyperactivity, aggression, jumping up, pulling on the lead or separation issues, chewing, digging, recall, play biting or just wanting to give your puppy the best opportunity to be a great family friend to your children, then I’m here to help. My career with dogs took a while to happen, but there have always been dogs in my life. I grew up in a farming community and my love of nature and animals came from there. Helping my dad with herding the sheep, watching how brilliantly the working sheepdogs helped reduce the workload was an inspiration. As well as the working dogs, we always had other dogs in the family, so my desire to work with animals and specifically dogs, was a true ambition. 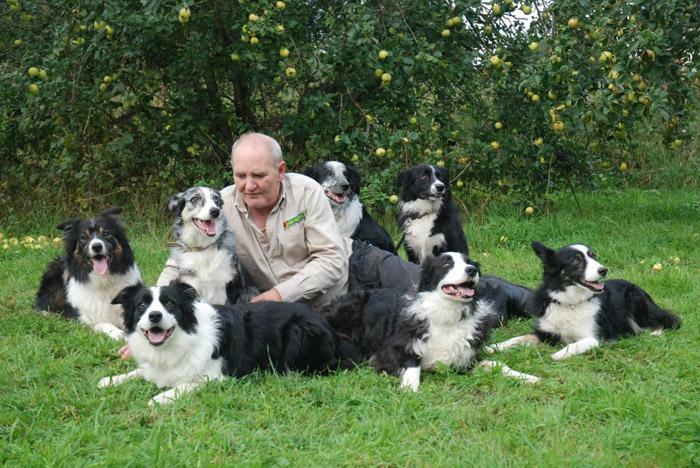 It was no surprise that although I initially started my working life in horticulture, travelling to Holland frequently, I still managed to have dogs. Two lovely German Shepherds who were looked after by family whilst I was away on business. They were very responsive and were a joy to train. My wife and I had various rescue Border Collies, Buster, Abbie, Max, Tilly and Jazz and we were also long term fostering two more for a dear friend. Then we adopted Gemma. Wow, she was a difficult girl! She was a very nervous anxious young 15-month-old Border Collie and had been showing serious aggression to people and dogs, hence her owners had felt obliged to shut her away most of the time reducing any socialising to a minimum and we discovered she wasn’t house trained either. I was determined to help her and took her to training classes, but wanted to understand her more, so took and passed with merit, my Diploma in Canine Psychology. 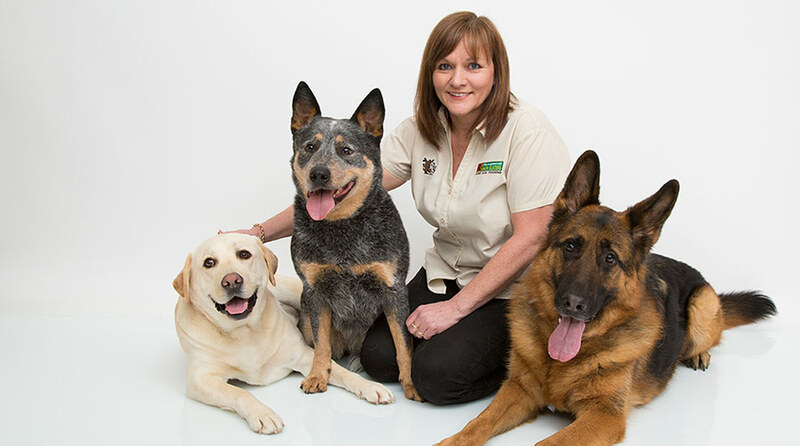 It certainly helped me with Gemma, but made me even more determined to make a career with dogs as the focal point. A good friend mentioned Bark Busters Home Dog Training to me, and I realised after meeting with them, this was my dream job and I now work with dog owners like you in and around the Northwich area. Training was intense, but enjoyable and I learned the kind, gentle techniques which are so well suited to calmly help dogs and their owners. I demonstrate the training techniques and then coach you to be able to carry on the training daily, to further the improvements experienced at our first lesson. I was able to fully rehabilitate young Gemma. We had a great time competing in agility and before she retired, we were able to achieve national level in Kennel Club agility competitions, obtaining the highest KC award of Agility Warrant Gold. I was very proud of her! In addition to helping families with their dogs, I am also a KC Agility judge and I give my time free of charge to Cheshire Dogs Home, working with the difficult to rehome dogs to ensure that they can find their forever homes. If you are not fully enjoying your dog, are feeling challenged by unwanted behaviour, would like to be able to enjoy your walks on and off lead, be able to trust your dog to respond when you call them back to you, never have to worry about leaving your dog at home knowing that there will be no toilet accidents or destruction, not having your arm wrenched by a lunging dog at people, cars, bikes or other dogs, neighbours complaining about excess barking, then call me and with our unique written Support Guarantee, you will have the peace of mind that any further visits will be free of charge. 94.2% of my clients rate their experience with Bark Busters as 4 or 5 out of 5 stars. 97.5% of my clients would recommend Bark Busters to their friends and neighbours. 97.5% of my clients think that their dog responded to the training. Average rating 4.7 out of 5 based on the last 120 reviews out of 156. Neil gave me much more confidence to lead. The door work was really useful. It's good to know that I can contact Neil between visits if I need him. The family found the visit very beneficial. Neil accepts payment by cash or the debit and credit cards below.